We are all plagued by email scams constantly but sadly many still fall prey to their tactics. The last received here is a new tactic in the domain registration type of scam and this notice will hopefully save you the trouble of wasting $75 and possibly much more trouble. article; warning that no reputable registrar ever deals via postal mail amongst other things. How to spot the scam? First and foremost there is no mention of any company here. We know all our domains are registered with domainsatcost.ca (always know who your registrar is) this is the fastest way to spot these scams. The message comes from the email "jinadeaton at whchcar dot com" (a completely unknown personal address) no reputable company would send email like this. Incidentally the "online payment" links point to the domain registrationdom.com which is just a redirect to http://iglobalmerchantservices.com/ a third party online payment provider (something like pay pal) so again, no indication is given where the money will actually go. Any reputable company would direct you to their web site. Another big huge red flag is the cost $75/ year! 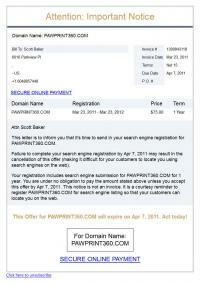 domain registrations cost at most $15-20 / year. Finally - did you spot what you were actually being "sold" with the email? It´s not even suggesting that it is a domain registration if you actually read the message. 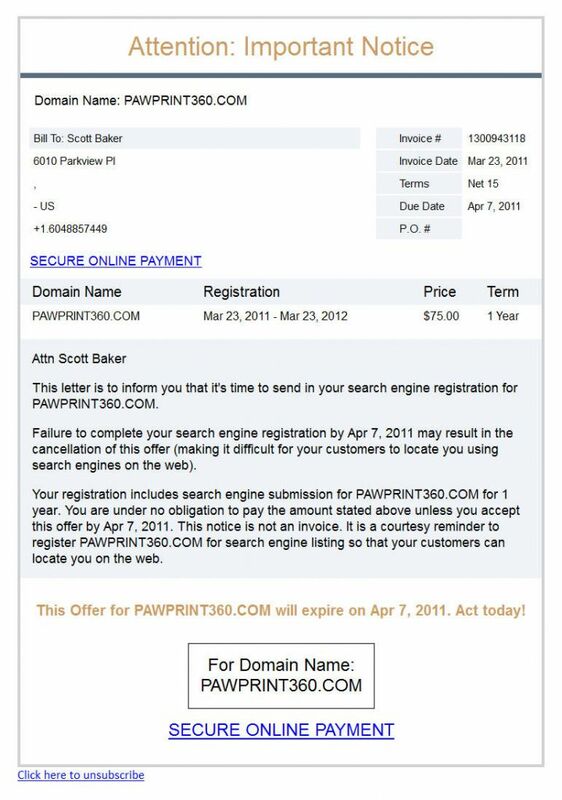 They are selling "search engine registration" which, doesn´t even exist! Creative wording abounds when you read carefully "Cancellation of this offer" and "it´s time to send in" as if it is something you have been doing for ages. Both phrases designed to play off the way us lazy humans just skim read nowadays. It saddens us that these type of underhanded tactics still manage to trick people out of their hard earned money but given how fast the world moves and the difficulty we all face in keeping pace with it, it´s not really much of a surprise. We truly hope that by identifying these types of scams and reminding you to always keep close track of your online providers you will not be one of the unlucky ones.